I hava a synology at home, mainly use to store important files, and realize beside have a backup of my server files on dropbox, may be it can have another copy in Synology as well. 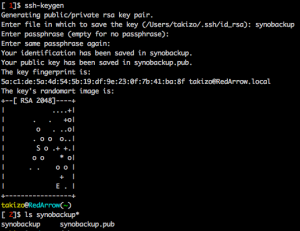 I explored the possibility of rsync the backup either on dropbox or server into synology, and… it works! Here is what you need to prepare before proceed with the backup. 1. Create a directory for backup. i.e folder name of ServerBackup. Go to “Control Panel” -> “Shared Folder”. 3. Try to ssh into Synology with username “root”. The root password is the same with “admin”. If are you done, let’s do it. 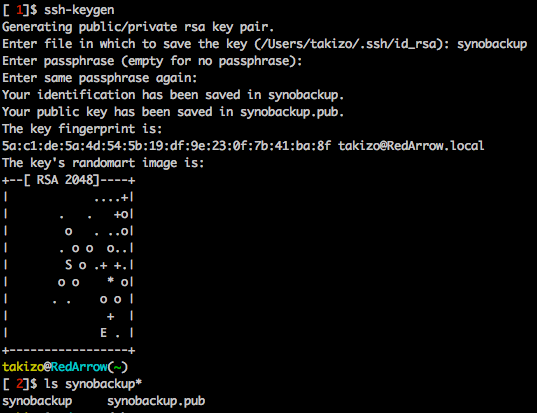 2. synobackup.pub – This is the public key which will be placed on the remote server. Ok.. we are done with ssh thingy. Let’s write some script. Next, we will do some scripting as below. #We will be using rsync in synology, this will do the rync! Please take note that the remote folder is define by yourself. We are done with the script, it’s time to Execute it! Due to it’s the first time access to the remote server, you need to manually run the script in shell to accept the SSH session. We are almost there. The authenticity of host '[godzilla.takizo.com]:2222 ([123.456.123.111]:2222)' can't be established. ECDSA key fingerprint is f7:9b:d6:92:7b:33. Warning: Permanently added '[godzilla.takizo.com]:2222,[123.456.123.111]:2222' (ECDSA) to the list of known hosts. This will add the host into /root/.ssh/known_hosts, when the script is run next time, it will not prompt the message again. Since the script is working perfectly fine. The last step is add it into Synology’s Task Schedule. 6. Put up a schedule for this, how often it should run and at what time. After the schedule has been created, try run it again and check is the files transfer into your Synology folder (if you don’t have new copy of file in the server, delete the files earlier being rsync into synology). Nothing in the startup of the Synology NAS software ever told me the password for user Admin. Thus it is impossible to log in as root. I changed the password to user admin but the only way I can become root is via sudo. Your example doesn’t show you logged in as root, it shows that you created your key files in /users/takizo/.ssh/ So what is the login as root instruction for? What user should create the key files? Does it need to be the one that owns the shared folder? Does it matter? You are very unclear about what is actually required. In the Task Schedule section you say “4. User choose “root” or any user you prefer”. Doesn’t it need to match the user the key was created for? You say “We create a folder name “scripts”, and the file will be placed in synology” . What is “synology”. Is that a directory name, or do you actually mean the scripts directory just created on the NAS drive? Very unclear. ← Are you a Programmer and Preparing for an Interview?